Since I had too many exams and too many papers to write, I did not have time to do any Urbanspoon research prior to my sushi adventure (but note that I always have time for the sushi adventure itself, no matter what). Once again, I had to play the game of randomly picking a restaurant and hoping that it would turn out to be decent. Well, the strategy for this game isn't too complicated: pick a restaurant that looks clean on the outside and has a good amount of people dining inside. That strategy landed me at Temaki Sushi on Broadway. 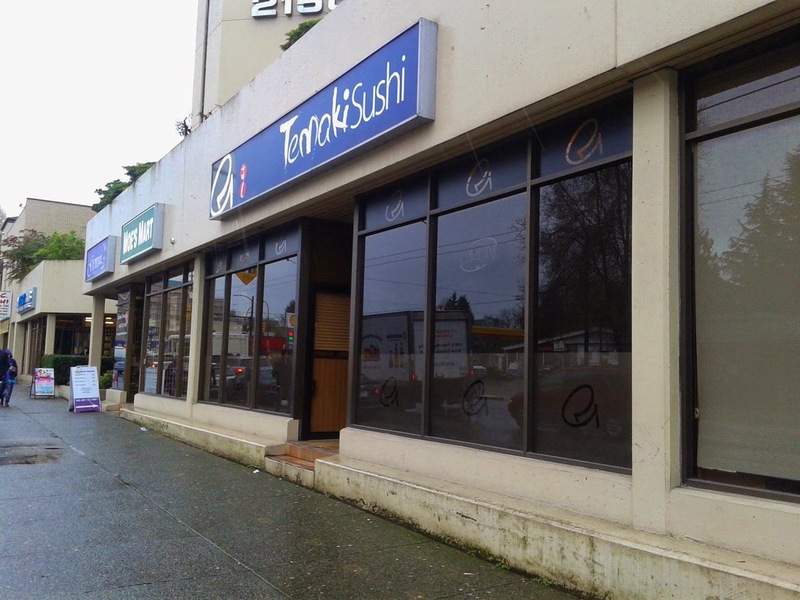 Temaki Sushi is a moderately large Chinese-operated restaurant and is quite a popular choice among locals. I made it to the restaurant just in time for lunch, so I got the Lunch Special Box B, which contained Miso Soup, Tuna and Salmon Sashimi, Gyoza, Gomae, and some Tempura. 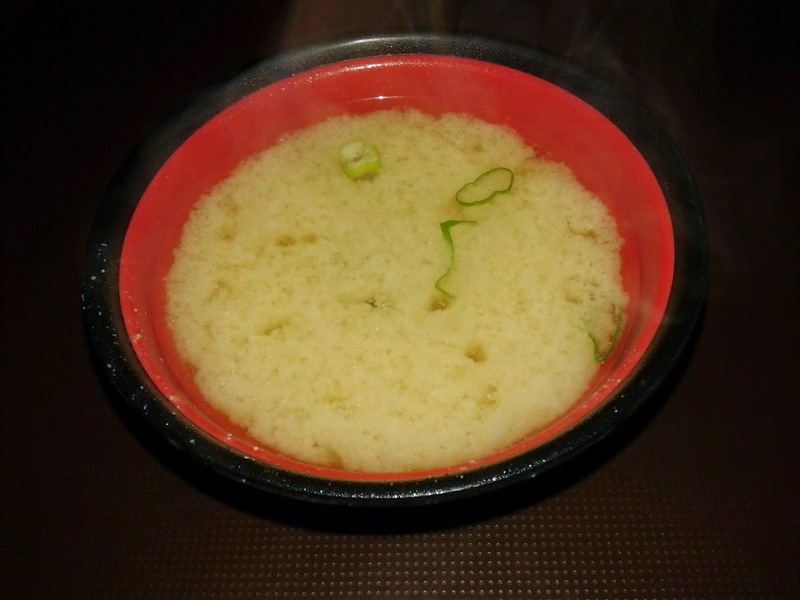 The Miso Soup was served at a nice, hot temperature. It had a good amount of miso paste, but was quite heavy on the salt. As the name of the restaurant is Temaki Sushi, I felt compelled to try at least one of their temaki (hand-rolled cones). My server stressed that I should eat the cone right away while it was still hot, so I took a photo of it in a jiffy and jammed it into my mouth as quickly as possible. 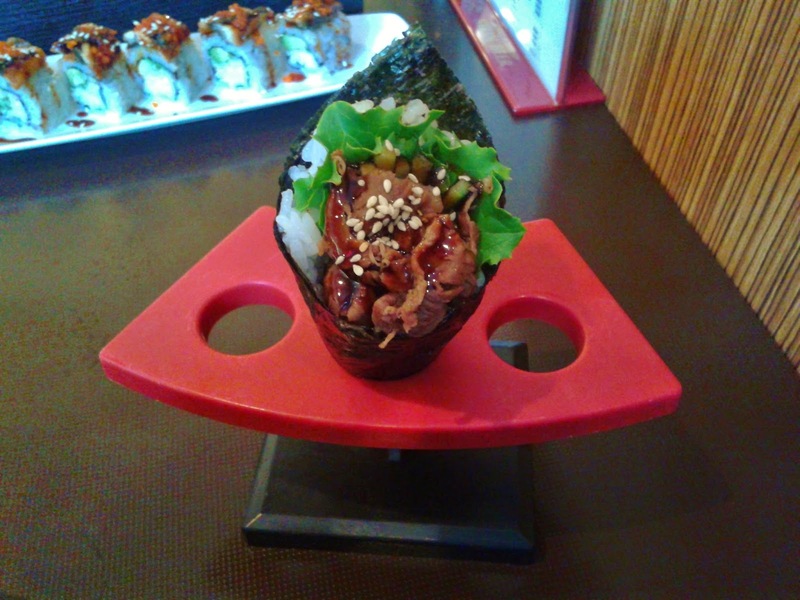 It was a decent cone, and I enjoyed the flavour and texture of the beef as well as how the seaweed was not soggy. It would be excellent with a touch more teriyaki sauce. Next, my Box B arrived. It was presented neatly, though at first glance, I was a bit worried that the Gomae would be difficult to break apart since it looked so compressed. I guess we'll see in a second how it turned out. 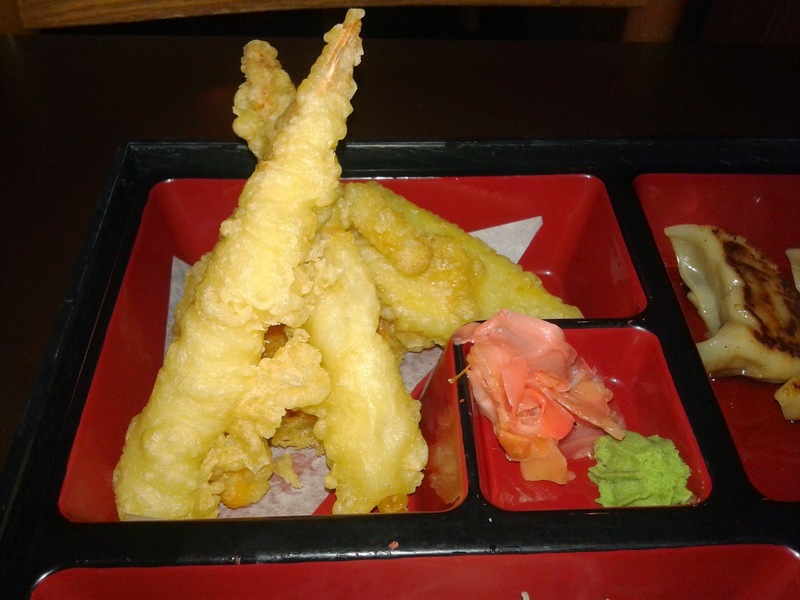 The Prawn Tempura (2 pcs) had some meaty shrimp with a good snap. The Kabocha (pumpkin) Tempura was on the skinnier side, but still had a decent amount of sweetness. The Yam Tempura was cut a bit too thick while the Sweet Potato Tempura was too thin (it pretty much qualified for a potato chip) with a slightly burnt edge. The Tuna Sashimi had a nice soft texture (and wasn't frozen! ), but it also had a bit of a fishy taste. 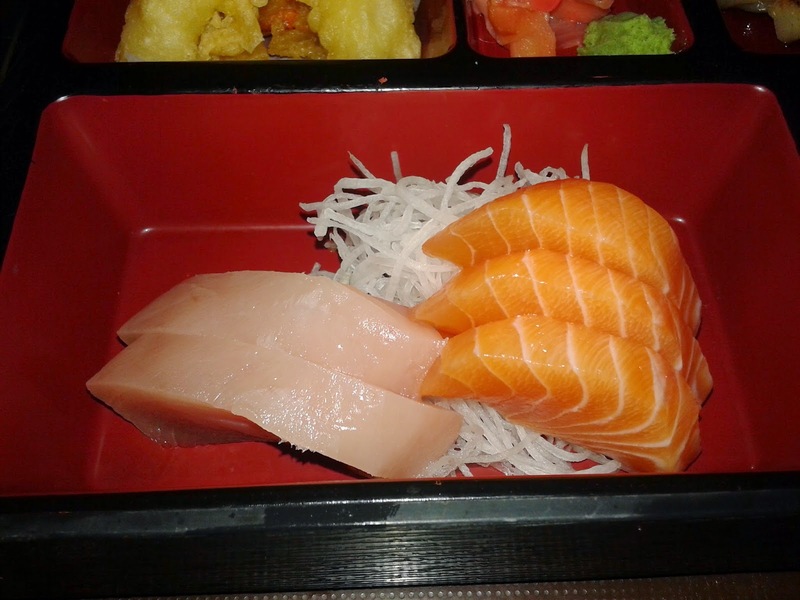 On the other hand, the Salmon Sashimi was fresh with a good flavour and a nice, smooth sheen. 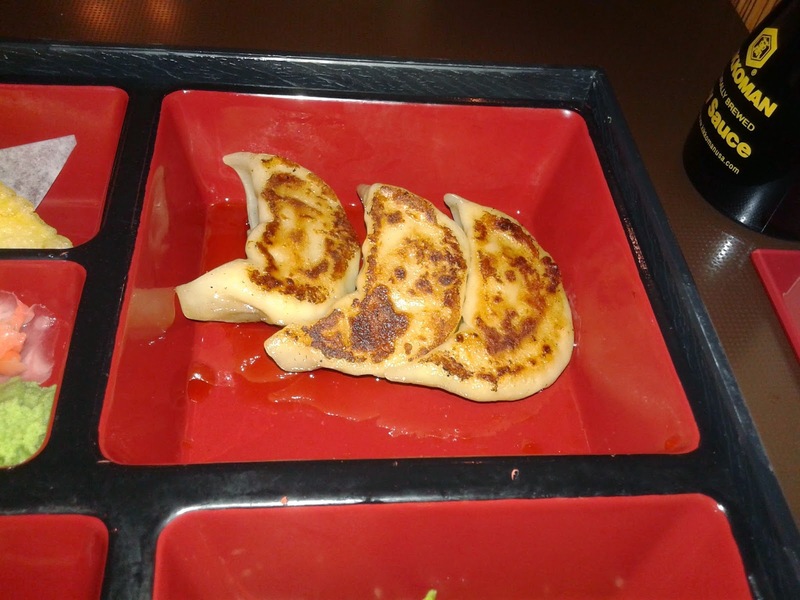 I wasn't a big fan of the Gyoza because they were quite soggy. 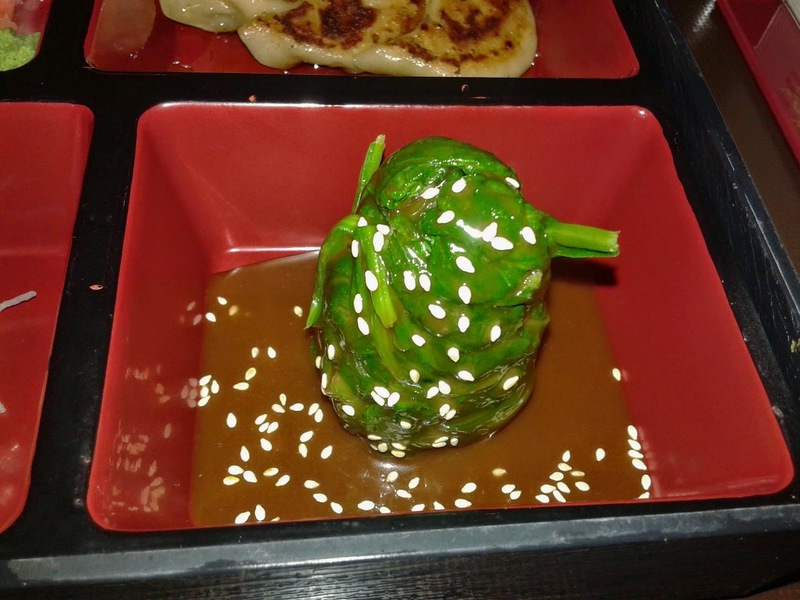 The sauce was tangy with a bit of vinegar, which made it taste a bit like Chinese fast food. The "compressed tower" of Gomae ended up being quite easy to disassemble. The peanut sauce was applied in the right amount for a balanced taste. It won't be a sushi adventure without sushi, so I got the Dragon Roll on the side, which consisted of unagi on top of a California Roll. 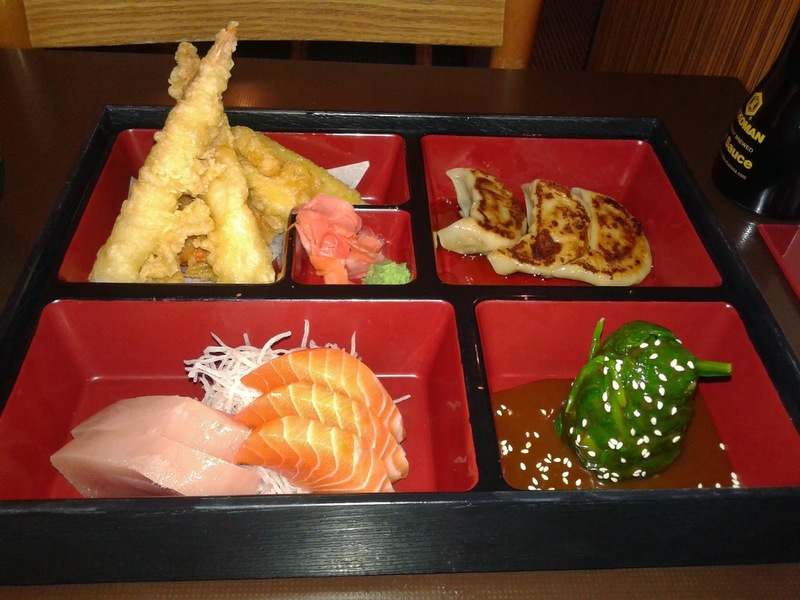 It was neatly presented and I really liked the smoky, sweet flavour of the unagi on top. The texture of the unagi was on target and the sweetness of the crab meat underneath rounded off this enjoyable roll. The service started off nicely and then began to taper as the restaurant was nearing its closing time. Interestingly, the staff seemed to be enjoying pho in the back instead of their own Japanese food. In terms of the food, my lunch was filled with some splendid items and some mishaps. The prices appear to be modest, but the portion sizes tend to be on the smaller side. Temaki Sushi has its pros and cons, but I wouldn't mind coming back to the restaurant if it happened to be convenient. Temaki is our go to for "everyday" sushi -- it is close, reasonable and they are pretty good with their time estimates for takeout. We stick to rolls, as we've had some misses with the cooked food. Their sushi rice is consistent, which is a big deal. And you would normally expect a Chinese-operated restaurant to excel at the cooked items!